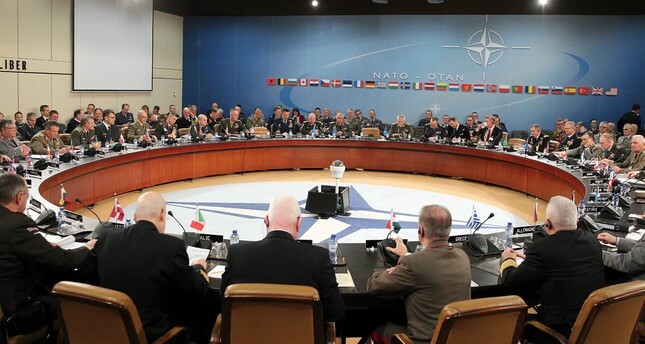 The NATO military committee in a meeting to discuss global terrorism, Brussels, Belgium, Jan. 16. President Recep Tayyip Erdoğan criticized the North Atlantic Treaty Organization during a Justice and Development Party (AK Party) parliamentary group meeting, saying he expects the alliance to intervene to halt American plans to set up an army in northern Syria composed of PKK terrorists and their affiliates. "Oh NATO! You are charged with taking action against those who are violating the borders of one of your alliance partners. And what kind of an action did you take until now? We are serving them notice…"
The Americans are establishing a force of 30 thousand militants that will be an army stationed in the north of Syria across the Turkish border; they are including PKK terrorists as well as their Syrian affiliates in the forces. These are terrorists who have, in the past, infiltrated into Turkey through Syria's borders and have undertaken terrorist actions killing our people. These are terrorists who trained suicide bombers that were involved in bloodbaths in Istanbul and Ankara. So there is a threat and a growing threat that is targeting Turkey's security by a secessionist movement and the Americans are actively supporting it… Can this be tolerated? Can an ally act like this way and get away with it? This is what Erdoğan is asking NATO. On Tuesday the NATO military committee met in Brussels and Turkish Chief of Staff Gen. Hulusi Akar served notice to his American counterpart that Turkey will not tolerate this behavior and it will put an end to the PKK's presence with a military operation first in Afrin in northern Syria and then in other parts to uproot the terrorist group and its affiliates. The Americans should take Turkey's warnings and anger seriously. In 1974 when the Turkish government said it will intervene in Cyprus after a coup led by the junta in Greece deposed the Makarios administration and tried to link the island with Greece. The Americans and even the British treated this as a joke and felt Turkey would not dare undertake such a military operation with its scarce resources. Yet, Turkey did land on Cyprus and effectively ended the Greek Cypriot intransigence. The Americans imposed an arms embargo on its "NATO ally" Turkey but years later had to lift the sanctions because they were self-defeating. The Turkish people never forgot the Americans' behavior during the embargo years. They have never been able to trust the Americans like in the old days. Today's Turkey is much stronger and more resourceful, while the Americans have proven to be losers all over the world. Turkey is simply telling the Americans, "We do not want to end our friendship but you have to stop helping our enemies and people who are on your list of terrorists. So when we launch an operation against the PKK in Afrin and elsewhere do not interfere or our friendship will be terminated." Turkey is also appealing to NATO to do its duty and stop this intransigent behavior by a NATO ally against another NATO ally. Both NATO and the U.S. have to take Turkey seriously because this crisis is testing not only the basics of NATO's existence but also the fundamentals of the Turkish-American relationship. History has shown you cannot toy around with the Turkish people.